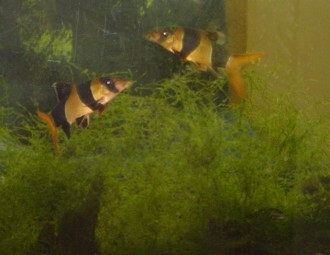 The loach or Botia macrarantha in Latin, originate from Borneo and Sumatra in Indonesia and Malaysia. They live in the freshwater streams there. They have orange/golden and blue/black bands around their bodies (as seen above) and can grow up to about 4 1/2 inches or about 11.5 centimeters long. The loach slots easily into a community tank as its nature is usually quite demure and friendly though it is a lively swimming fish which loves to school with other similar fish. Sometimes you will see the this loach lie down on the bottom of the tank or hide behind a filter or heater. On most occasions there is no need for alarm as that is the loach's preferred method of sleeping or resting. Just check to see if there are no other signs of trouble with other fish or water conditions etc. The loach also likes to hide and swim through little nooks and crannies and caves as it has a playful nature. It also likes the effect of the water filter "breaking" the top of the surface and creating currents because this is more like their natural environment in the streams of Indonesia and Malaysia. Another reason this is good is that the water will get more oxygen into it which keeps the fish happier and healthier. * These loaches are generally "bottom-feeders" and so appreciate food like chopped shrimp, cod roe etc that will fall to the bottom of the tank. They will rather easily adapt to flake food that takes longer to fall to the bottom of the tank. Indeed, my loaches often out swim the other fish at the top of the tank to greedily snap up the food before the smaller fishes can get any! * This type of loach can be quite an expensive imported fish so you need to be careful to make sure its environment is suitable. If you ensure a happy healthy environment the clown loach is generally robust, lively and a great enjoyment for your community tropical aquarium.